These cookies are light, crispy and buttery, perfect for any upcoming Spring tea parties. Don’t be fooled by the shape – they’re surprisingly easy and fun to form into these curves. Shaking powdered sugar over them while they’re hot makes the sugar stick to them and creates an instant icing. 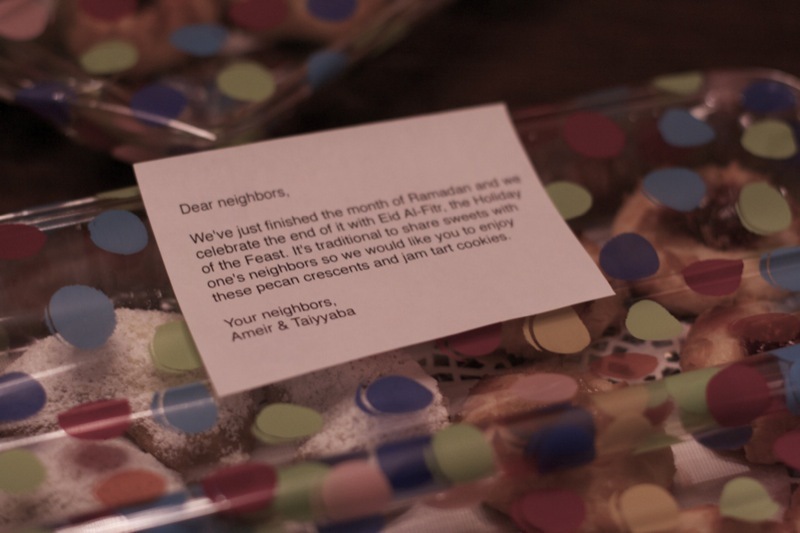 These were also a great gift to make for our family and neighbors last year on Eid. Thanks to Sara for helping me shape these and taking these great pictures! Preparing the nuts: You can use any nuts for this cookie, but do not toast them so the flavor and texture of the cookie stays light. If you’re using almonds, blanch them first. 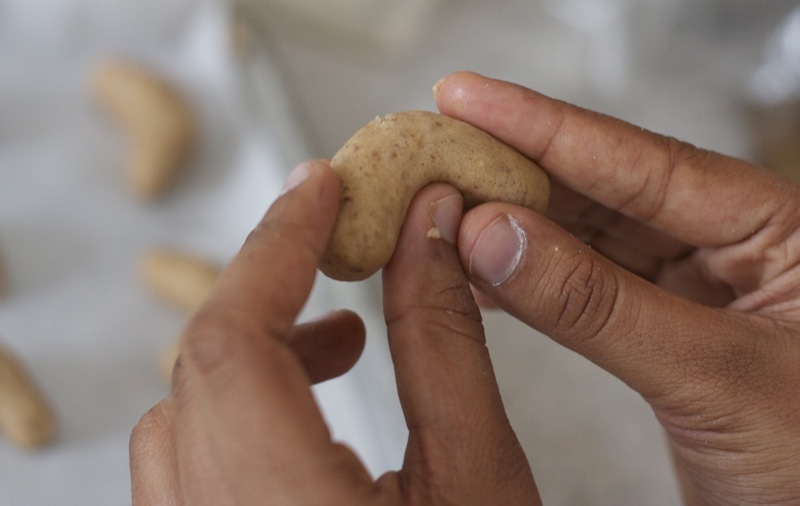 The “dry materials” making up this cookie are the all-purpose flour and ground nuts. Put the nuts, salt, and half of the granulated sugar in a food processor and let it go until the nuts are very finely ground. At this point, the dough will feel like a standard sugar cookie dough. Divide it into two parts, roll it up into a ball, and refrigerate for 1 hour to get it stiff enough to handle. Ready to shape? Measure out two tablespoons of dough. Roll it into a ball, and then into a cylinder shape (play-doh!). Then, curve the cylinder into a crescent – I found it helpful to push it around my index finger a little bit. At this point, you could also freeze the formed cookies and bake later. 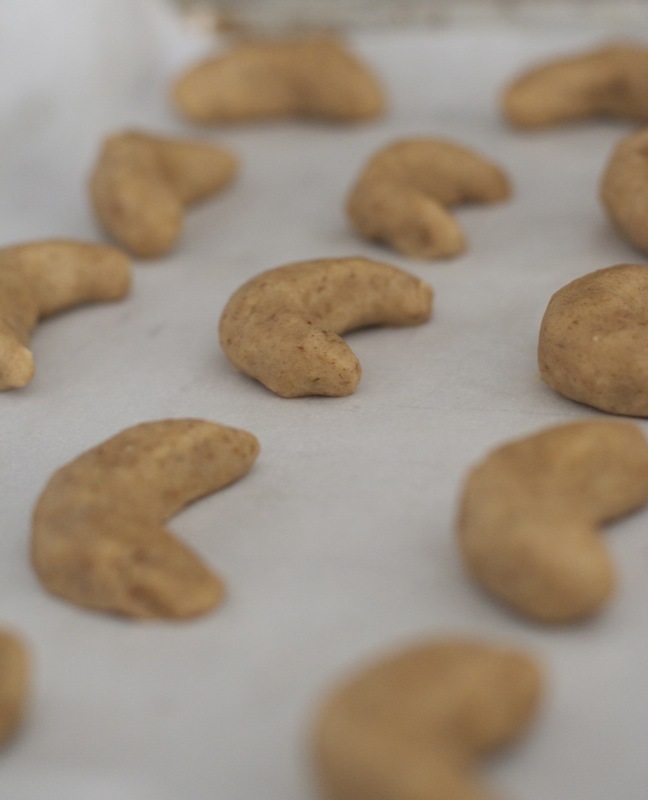 The cookies will swell a little bit and get airy and crispy on the inside. Put them at least 1 inch apart. You don’t need to grease the cookie sheet because there is so much butter in these cookies. Bake at 325F for 20 minutes. If you’re baking two cookie sheets at a time, switch them between the upper and lower racks after 10 minutes. While they’re hot from the oven, pull the cookies off of the sheet and put them on a wire rack. 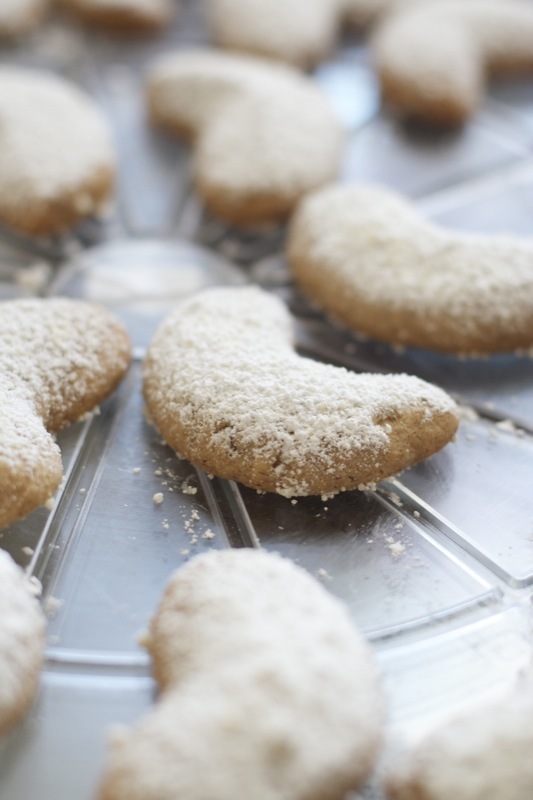 Immediately dust them (very generously) with powdered sugar and let them cool. This post made me wish I was one of your neighbors!